Also, keep in mind the Spark Core is open source design, and their site claims that actual parts are only about $15 if you have them made for you on a larger scale. Oh, so theoretically instead of graduating to the CC3200 development board and coming up with a design that could run purely on the CC3200 for an eventual theoretical board, we could just punt with the CC3000 + STM32F103 and board a board around that? I suppose that's a reasonable solution, if slightly suboptimal. It's probably worth playing around with both ideas, but check out this and this (slightly further down the same page) if you haven't yet. Over a number of hours this evening, and going to bed far too late, I have built most of the Hybrid BASIC program to configure the Spark Core over CALCnet. It uses the DCSB Libraries to speak CALCnet from TI-BASIC, as well as the DCS GUI API functions exposed in the DCSB Libs to draw the interface. Currently it can read the local and remote hub name from the Spark Core, display them, and let the user modify them. It can accept new WiFi credentials, but does not yet format them for sending to the Spark Core. The Spark Core firmware has also been modified to deal with these messages. The messages are: 'C' to read the current hubs configured on the Core, 'L' to set the local hub name, 'R' to set the remote hub name, and 'W' to set the WiFi credentials. All of these messages are sent as String-type CALCnet BASIC frames to a special bridge address defined as FFFFFFFF. This means that CALCnet/gCn now has three special addresses defined: 00000000 for broadcast, AAAAAAAA for software that bridges gCn to an internet service, and FFFFFFFF for the bridge connecting a local CALCnet network to gCn. Once the functionality has been finalized, I will take more screenshots and videos, package up the code for the Spark Core and for the BridgeCfg program, and post up some Cemetech news. This is looking awesome, Kerm! Can't wait to see what it's like when it's done! Will it be able to save different configurations and then load them, say, from an AppVar or something? This is looking absolutely fantastic! Is there going to be stuff implemented into DCS7 and DCS8 hybrid libs to utilize this wifi connection? does it have the capability to just directly connect two calculators without a cable? No, and no, respectively. For the first question, you can still use CALCnet BASIC. We'll be patching Doors CS 7.2 to fix a few small bugs with CALCnet BASIC on the TI-84 Plus calculators. My bridge configuration program does not provide this functionality. If someone else wants to expand it to allow that, I would heartily support that effort. 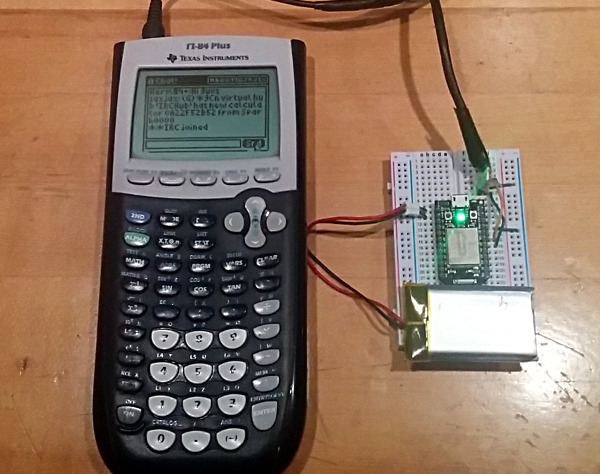 *bump* I succeeded in getting my TI-83+ to be able to set WiFi credentials on the Spark Core, after wrestling with many poorly-documented constraints in the WiFi Wiring module and bugs in the firmware. For photographs, I used a LiPo battery to directly power the VIN/GND pins of the Spark Core, eliminating the need to power it over USB. I will post a full news article including my code tomorrow, but for now, here's a photograph. This is good news! Keep us posted. As for this project; it's looking fantastic, keep up the good work! © Copyright 2000-2019 Cemetech & Christopher Mitchell :: Page Execution Time: 0.169754 seconds.